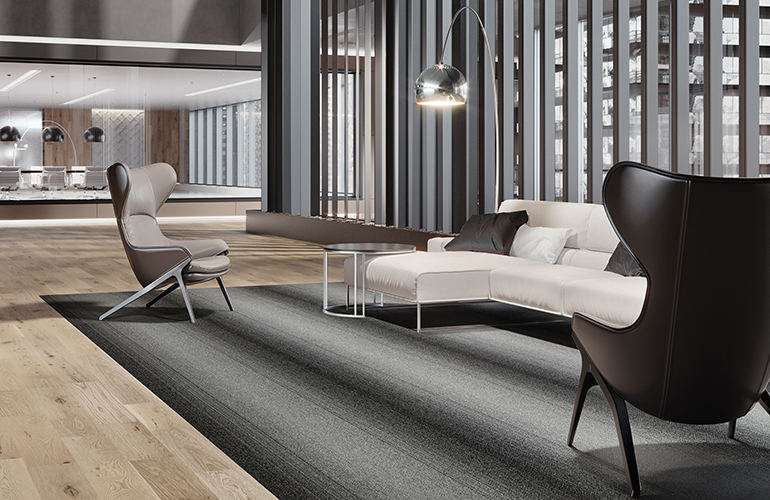 Red List-free Sunweave is available as a bound area rug or as a wall-to-wall woven installation. Photography courtesy of Mohawk Group. 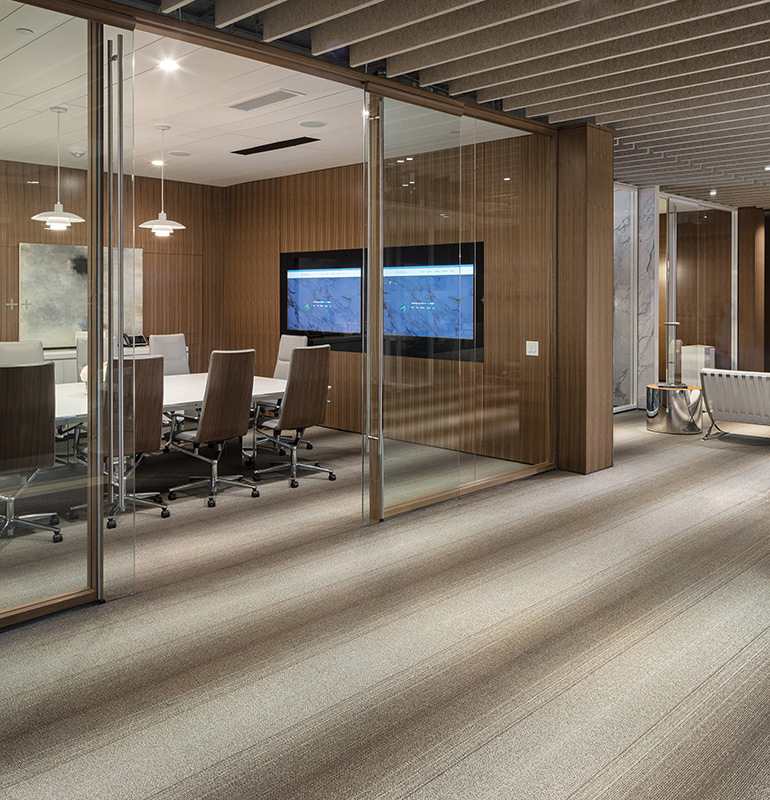 Mohawk Group continues to lead the commercial flooring market with a new woven broadloom carpet that epitomizes the best in contemporary taste. First presented at NeoCon 2018, Sunweave finds inspiration in indigenous woven techniques—looking at everything from baskets to blankets and other textiles from around the world. It blends these motifs with modern global trends, such as biophilia, carbon neutrality, and artisanal materials, creating contract spaces that are infused with authenticity and warmth. Throw in domestic manufacturing and a Living Product Challenge Petal Certification and it’s easy to see that Mohawk is staying ahead of the curve in aesthetics and social responsibility initiatives. 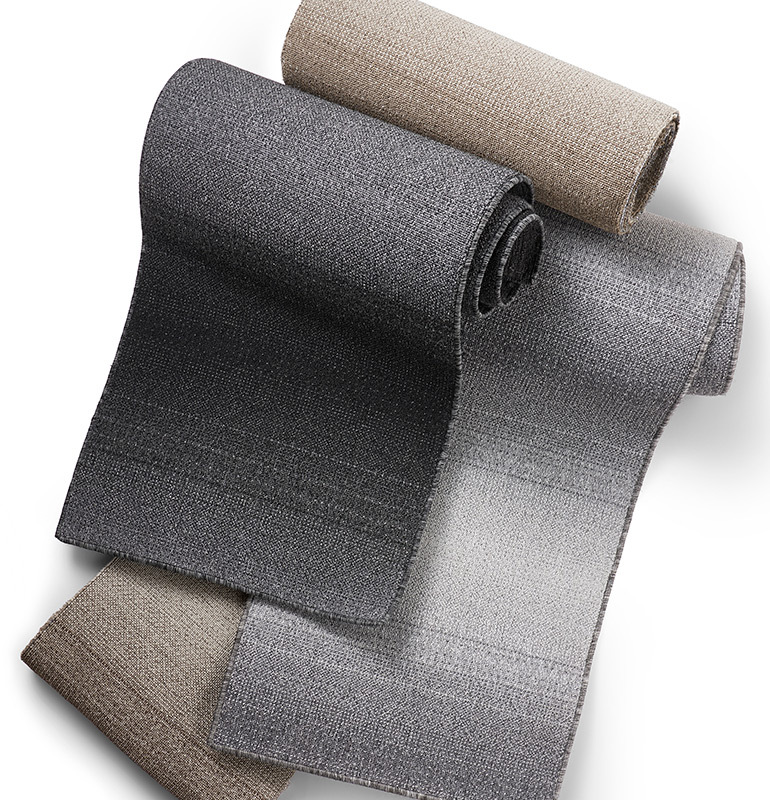 Sunweave’s Shadow Pass is ideal for both large and smaller, intimate contract spaces. Photography courtesy of Mohawk Group. These machines, located at Mohawk Group’s historic Karastan mill in North Carolina, use pile wires horizontally across the loom to mimic and accentuate the qualities of hand-woven fabrics. The three-frame Wilton loom creates a tight and sophisticated visual using the brand’s award-winning Heathered Hues yarn to form Sunweave’s debut pattern, Shadow Pass. This pattern features a grand linear ombré shadow that transitions along a floor plane, making it ideal for both small and large spaces. The inspiration for Shadow Pass came from the way shadows handcraft subtle color and value shifts as the sun moves through its daily progression across the sky. Shadow Pass comes in four color variations including Root, Sedge and Hull (not pictured: Japanese Indigo). Photography courtesy of Mohawk Group. To offset the energy used to produce Sunweave, Mohawk engaged in a unique “handprinting” initiative, partnering with Virginia’s Hampton University to install 152 low-flow showerheads, equating to an annual water savings of approximately 4 million gallons. Mohawk has also partnered with Groundswell to ultimately install 10 smartflower™ solar systems at community centers and schools with STEM programs across the U.S. Mohawk is not only committed to bringing warmth back to commercial interiors through flooring products like Sunweave, but to leaving a lasting impact through meaningful initiatives and manufacturing practices that give more back to the environment than they take.